Under the National Government between 2009 and 2017, drilling rights in the deep ocean surrounding New Zealand were sold off to big oil companies including Petrobras, Anadarko, Shell, Statoil and OMV. The Texan oil company Anadarko drilled a deep sea exploratory well off the coast of Raglan and then another off the coast of Dunedin risking catastrophic oil spills. Exploratory drilling is the most dangerous part of oil production and adding the challenges of drilling in very deep water compounds the risks. 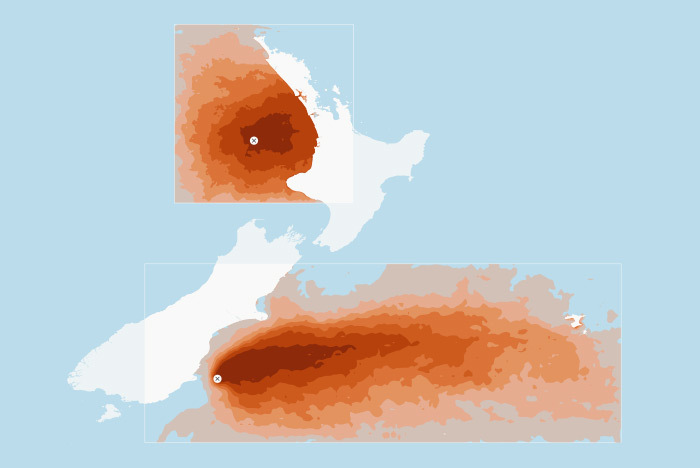 Greenpeace NZ modelled what could happen in the event of a spill at both sites. Following a long and hard-fought campaign against deep sea oil drilling, the Ardern Government put an end to oil exploration in April 2018 putting NZ's vast EEZ off limits to oil exploration. This leaves only a small number of existing permits at risk from exploratory drilling. Probabilities of oil exceeding 1g/m2 in summer after 120 days for both locations targeted for deep sea oil drilling. From light to dark: 5% - 20% - 35% - 50% - 65% - 80% - 95%. We are sorry this interactive map is not available for small devices. Please make sure to visit this web site on a tablet or personal computer for the full experience. We are sorry, your system does not support the fully interactive version of this map. Please use a modern browser on a desktop computer for the full experience, or continue to the limited, (but still richly informative) version of this map.